There are two muscles in the lower legs called the peroneus brevis and peroneus longus muscles. The peroneus brevis muscle travels towards the foot and its peroneal brevis tendon connects to the fifth metatarsal bone, which is the long bone in the feet that connects to the small toe bone). 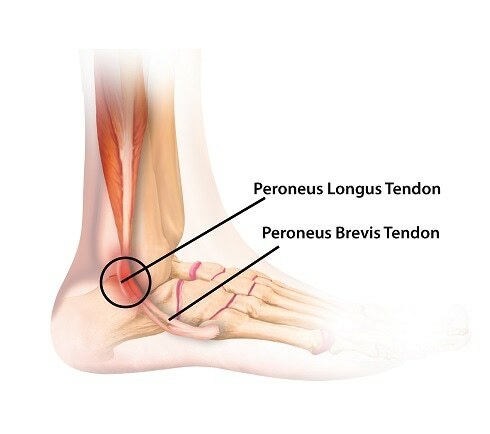 The peroneus longus muscle, on the other hand, travels towards the feet and the peroneal longus tendon connects to the first metatarsal bone, which is the long bone in the feet that connects to the big toe bone, and to the bone right behind the metatarsal bone. These two muscles allow the foot to rotate outward (eversion) as well as downward (plantar flexion)and provide lateral ankle stability. The purpose of the connective tissue peroneal tendons, like all tendons, is to connect muscles to bone, allowing the muscle to exert force on the bone in order to execute movement. Peroneal tendonitis is inflammation of the peroneal tendons, usually resulting from overuse from repetitive movements. It is the most common cause of lateral ankle pain due to overuse. In general, peroneal tendon disorders are relatively uncommon, and are frequently seen in sports that involve cutting manoeuvres such as snow skiing. Tendon injuries are difficult to treat as symptoms are commonly mistaken for other injuries, such as a lateral ankle sprain, so they are generally underdiagnosed and underreported. Patients of peroneal disorders usually relay a history of an ankle sprain that never recovered. Delay in treatment runs the risk of ankle instability, chronic pain and deformity. These overuse injuries are usually the result of a change in a training or exercise regime and an inadequate rest period. Although peroneal tendonitis is usually due to overuse from repetitive movements, it can also arise from a traumatic event, such as ankle sprains, chronic ankle instability and fractures, which is the second leading cause. A physical examination that includes inspection for swelling and palpation (examining using the hands) is usually performed. The patient’s history is critical to making the right diagnosis. Conservative treatment is usually the first option for peroneal tendonitis, and includes the use of brace and alleviating the weight bearing load on the affected ankle. Non-steroidal anti-inflammatory drugs (NSAIDs) may also be prescribed. If symptoms persist after months of conservative treatment, surgical interjection may be necessary. DiDomenico, L. A., and Anania, M. C. (2012) Peroneal Tendon Disorders, Wolters Kluwer. Palmanovich, E., Laver, L., Brin, Y. S., Kotz, E., Hetsroni, I., Mann, G., and Nyska, M. (2011) Peroneus longus tear and its relation to the peroneal tubercle: A review of the literature, Muscles Ligaments Tendons J 1, 153-160. Benjamin, M., Toumi, H., Ralphs, J. R., Bydder, G., Best, T. M., and Milz, S. (2006) Where tendons and ligaments meet bone: attachment sites (‘entheses’) in relation to exercise and/or mechanical load, J Anat 208, 471-490. Simpson, M. R., and Howard, T. M. (2009) Tendinopathies of the foot and ankle, Am Fam Physician 80, 1107-1114. Pereira, H., Ripoll, P. L., Joaquim M. Oliveira , Reis, R. L., Espregueira-Mendes, J., and Dijk, C. N. v. (2014) Peroneal and Posterior Tibial Tendon Pathology Springer-Verlag.